Had great fun with The Bead Mavens’ Bead Soup Double-Up. 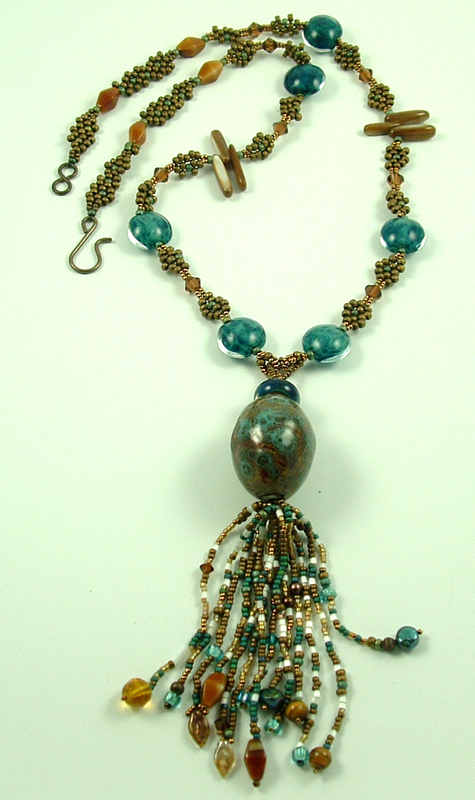 The focal in my bead soup, from Mandy at Beads for Brains, handed me my color palette – warm browns and the full gamut of my favorite blue-greens. 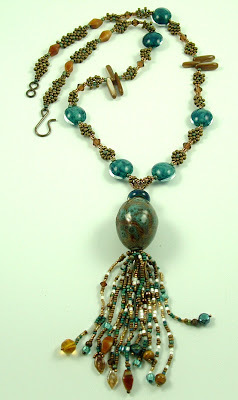 The moment I saw the egg-shaped pendant, I knew I would create a fringed tassel with it. After experimenting with several neckstraps, I settled on one inspired by Christie Dunn’s Autumn Renewal design (Beadwork, Sept. 2009.) Square-stitched and freeform peyote sections of seed beads and crystals connect the lampworked discs and butterscotch spikes and diamonds. I couldn’t believe my luck when I found these Grace lampwork discs swirled with the same dark and light teals as the pendant! Since it’s a rather heavy focal, I made a small loop at one end of a piece of 14-pound Fireline to hold the fringe, strung my focal beads, pulled the fringe up through the focals and created a larger loop to connect with the loops at the end of each strap. After securing with a crimp tube, I realized I didn’t have a decorative cover large enough to slip over the crimp. With the deadline looming, I square-stitched a 4-bead-high collar to match the strap ends, snugged it against the crimp, connected the ends, and problem solved! It gives a nice finish to the focal. I may never use a decorative crimp cover again! Thanks so much to the Bead Mavens for sponsoring this event and to Mandy for gifting me with a great selection of beads. 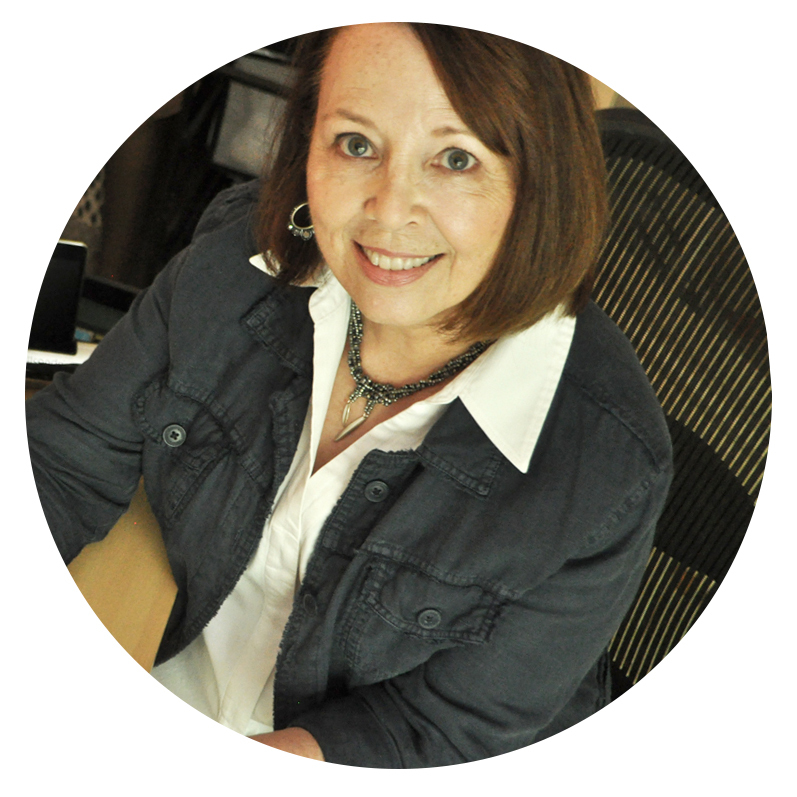 Check out all the design results in the Bead Soup album on the Mavens' blog. Karin I just love this! 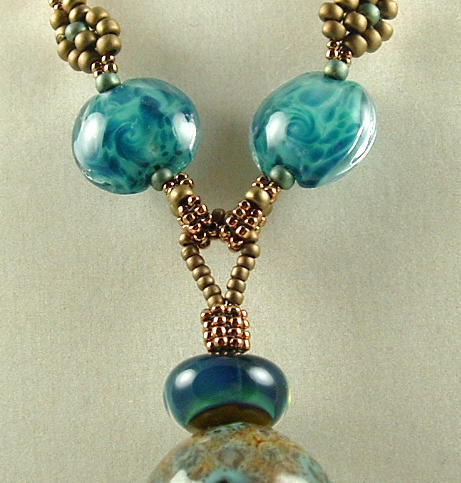 Those lampwork beads are perfect and the crimp detail is genius! Thanks so much for being my partner in the swap!